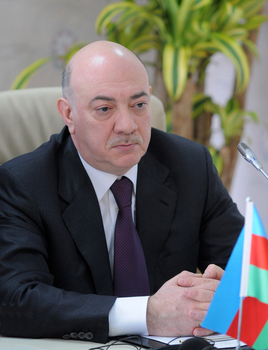 The Azerbaijani state seeks to settle the Armenia-Azerbaijan Nagorno-Karabakh conflict on the basis of the norms and principles of international law, Assistant to the Azerbaijani President for Work with Law Enforcement Bodies and Military Issues Fuad Alasgarov said on July 18. He made the remarks at a solemn event dedicated to the 20th anniversary of Azerbaijan National Agency for Mine Action (ANAMA). Alasgarov noted that ANAMA is entrusted with such an important task as ensuring the safe return of internally displaced persons to their native lands after the liberation of the occupied territories. “Over the 20-year period of ANAMA’s activity, it fulfilled its tasks, and the agency attracted professional staff, the material and technical base was brought to modern standards,” he said. Alasgarov reminded that in 2017, in accordance with the orders of the Azerbaijani President, the territory of more than 3.5 million square meters was cleared of mines in a short time in the liberated village of Jojug Marjanli in Jabrayil region. “Since the beginning of its activity, ANAMA established effective cooperation with many international organizations, including the relevant structures of various states, and exchanged experience,” he said, adding that the involvement of the agency in operations not only in Azerbaijan but also abroad shows the high professionalism of its staff. Assistant to the President also noted that sappers, often putting their lives and health at risk, perform their glorious and humane duties. “The country’s leadership pays great attention to their activity, the material and technical support to ANAMA gets enhanced, its employees are awarded state awards,” Alasgarov said. ANAMA was established in 1998 for planning and coordination, management and monitoring of mine action related activities all over the country. The problem of unexploded ordnance in Azerbaijan can be divided into the areas that are still under the occupation of Armenian forces and other areas of the country. Most of the UXOs are the result of Armenian aggression. Over the past year, ANAMA defused up to 93 million square meters of the Azerbaijan's territory, detecting and defusing 35,117 UXOs, 204 anti-tank mines and 35 anti-personnel mines. In general, ANAMA cleared 529,314,780 square meters of Azerbaijan’s territory, discovered and defused 796,972 UXOs over the 20 years of its activity.